Create a roomy, versatile tote bag you'll use again and again! With its water-resistant oilcloth lining and securely stitched nylon straps, this bag can really be loaded up. It's ideal for groceries, picnics, and more. Use the instructions for optional inside pockets and you have a great diaper bag. Finished size: 12" x 13"
I've been carrying grocery bags since the 90's and have made several. 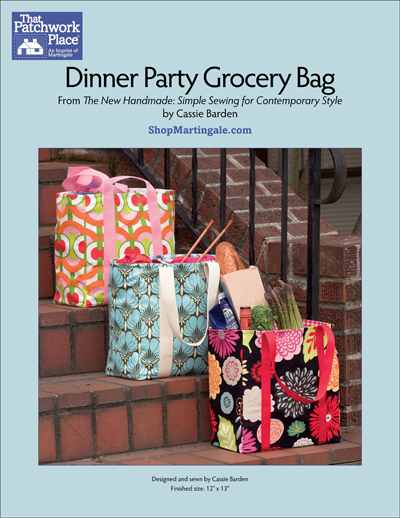 This pattern is so easy, it's exactly like some of the bags I purchased. Like all grocery bags, they get 'old' after use. This pattern is fast, easy and you can make it in the plastic covered cloth, oil cloth or even in leather, let alone cotton fabrics. It's really fun and easy, makes a great pattern for 4H clubs or sew day or to make for fund raising. 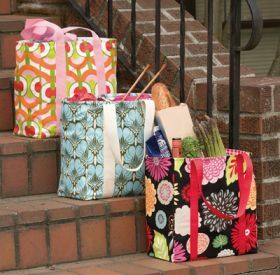 At a sale price it's a 'must' for your pattern stash! Cassie Barden has been involved in making art her whole life, from cartooning, filmmaking, and painting to making odd stuffed animals and creating costumes for Burning Man and Halloween. An interest in both sewing and fashion inspired her to start creating her own one-of-a-kind bags and accessories that appeal to both her utilitarian and style-conscious natures. When she's not sewing, Cassie enjoys two Seattle institutions: live music and drinking coffee. Cassie is inspired by contemporary art and design, anything retro or old-fashioned, and Seattle's urban culture.